This is the first game in the Postman Pat series. 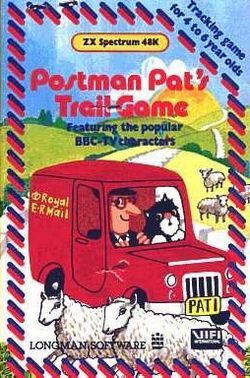 For other games in the series see the Postman Pat category. Postman Pat's Trail Game is an action game that had been developed by Micromega for Longman Software, and released on the Sinclair ZX Spectrum and Commodore 64, in 1984; it is based on the Woodland Animations series of the same name which aired on BBC1 from September to December 1981 (which may have been aimed at pre-schoolers, but this game was aimed at 4- to 6-year-olds!). In what would be the first of four games featuring him, Pat has to locate various vehicles and animals (including Jess), by driving his van around Greendale; he starts at the village's Post Office, where the vehicle drives (or the animal walks) away before he gets into his van. The vehicles and animals leave trails behind them (hence the game's title) and Pat has to follow the trails to get to them - but once he has done so, he will have to return to the Post Office (before a timer runs out). Hitting the sides of the roads, or cows, will also cause the timer to advance faster; also, cows take a considerable amount of time to get off the roads, so Pat will either have to wait for them or find an alternative route. Once Pat has returned to the Post Office he will receive a bonus and have to locate another vehicle or animal - and the game will continue until Pat either fails to return to the Post Office or you turn off the console. This page was last edited on 12 March 2017, at 13:30.